The talk of the day, or at least among the people I socialize with, has been a young Aubrey Drake Graham, better known, (and probably only wants to be known), as Drake. 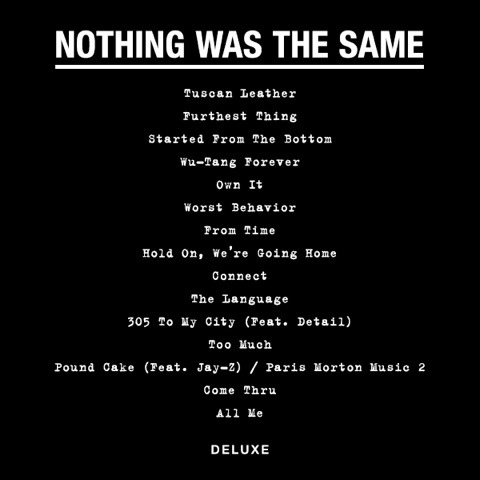 He decided earlier today to reveal the official track-list of his upcoming album “Nothing Was The Same”, which is set to be released on September 24. The album is scarce of features, as there are only two, one being none other than Jay Z, (who has been everywhere this year by the way). Jay Z was recruited to do a couple verses on the album’s final track “Pound Cake”. In the past, Drake has created music that kind of makes me think of him as a male, rap version of Adele. He makes the type of music that you listen to by yourself in the dark, while rocking back and forth with tears streaming down your face reminiscing about a lost love, and I suspect “Nothing Was The Same” will be no different. So, on the 24th of September grab yourself a tissue box, and let Drake put you all in your feelings. Tags: Adele, Album, Drake, HipHop, Jay Z, Music, Nothing Was The Same, Thank Me Later. Bookmark the permalink.